The exhibition of the Tambar Springs Diprotodon is situated in the Coonabarabran Visitor Information Centre/ The Bicentennial Exhibition building. It contains a skeleton of diprotodon and some other megafauna specimans. These exhibits are part of the Australian Museum Collection. The megafauna display opened in 1997. The Bicentennial Exhibition Building also houses displays on astronomy, geology, forestry and local history. 9.00am - 5.00pm daily. Closed Christmas Day. The main exhibit is the skeleton of a diprotodon optatum, the largest known marsupial. It was discovered at Tambar Springs in 1979. The display also includes other specimens such as a lower jaw of Protemnodon, an extinct giant wallaby. The exhibition is complemented by a mural of a diprotodon by artist Peter Schouten, and a series of interpretive labels highlighting the discovery of the Tambar Springs Diprotodon. 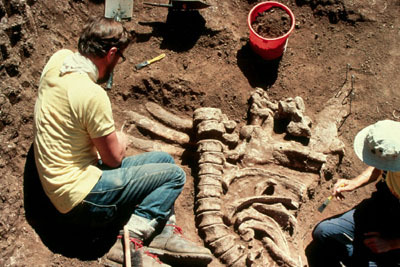 Excavating the skeleton of an extinct marsupial, Diprotodon optatum, at Tambar Springs in 1979. Image by J.Field/Nature Focus, Australian Museum. 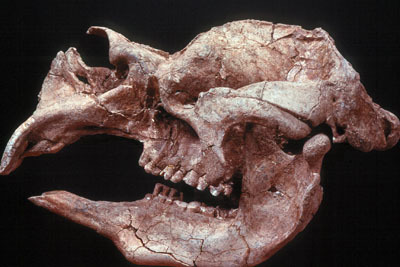 The skull of the Tambar Springs Diprotodon discovered in 1979.